Produced by the Civic Center Conservancy, the FREE Civic Center Bike-In Movies Series invites cycling enthusiasts (and those using all other modes of transportation) to spend summer evenings in Civic Center Park. 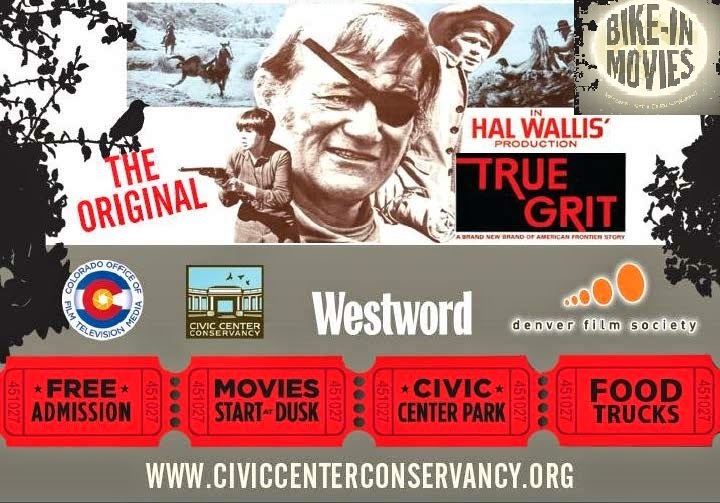 In celebration of Colorado Day - which in 2014 marks the 138th anniversary of Colorado becoming a state - the Colorado Office of Film, Television & Media, Westword and the Denver Film Society are sponsoring this free screening of the original True Grit starring John Wayne, Glen Campbell and Kim Darby. This film was selected by the Colorado Office of Film, Television & Media in honor of "Colorado Day" because filming took place mainly in Ouray County, Colorado, in the vicinity of Ridgway, around the town of Montrose (Montrose County), and the town of Ouray with the courtroom scenes were filmed at Ouray County Courthouse. Please note that the original"True Grit" is Rated G - making this a good movie night option for families. That said, the 1969 film is a Western - with outlaws and shootouts typical of the genre. Attendees can bring picnics or purchase from on-site gourmet food trucks beginning at 6:30 PM, with the show beginning at dusk.